In the Lotteria (or Lotte) fast food outlets in Japan, curious things called Deka Tamagotchi's exist (photo above). Deka Tamagotchi's are about 20cm tall and about 15cm wide. They first appeared in 2004 and as far as I know, they're still there. Deka's are also now found in Toys Shops, Supermarkets and even Karaoke Bars. Use of the Deka is free! Technically known as a "Ouchi no Deka Tamagotchi" (Home Huge Tamagotchi), this is the home version of the Deka Tamagotchi - it's about half the size as the other Deka, but is still a bit bigger than a normal tam. It has a built in stand that folds out. 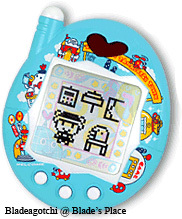 The character in the Home Deka is a female Tamagotchi that lives in a small house in Tama Town. You can play games with her and unlock Gotchi points, which you can then transfer back to your Keitai, Akai or Hanerutchi Tamagotchi OR you can also use the points to upgrade your characters house, and eventually she will live in a Japanese Palace! She can also keep pets, the capacity of which depends on what Upgrade stage the house is in. It takes one 'AAA' battery, comes in blue or pink, and was released in July 2005 in Japan only. A Green coloured Home Deka was released in Japanese Toys R Us stores. Other versions of the Home Deka were launched in Japan, including "Quishideka" and "Golden Deka". A TamaStation is a Japanese Arcade Game (naturally, found only in Japan) that you can connect an Entama, UraTama and TamaSuku to. I believe that Tamagotchi Trading Cards with barcodes on them can interact with the TamaStation to enable special items and things on your Tamagotchi. There's another version of these, called the "TamaStation 2".